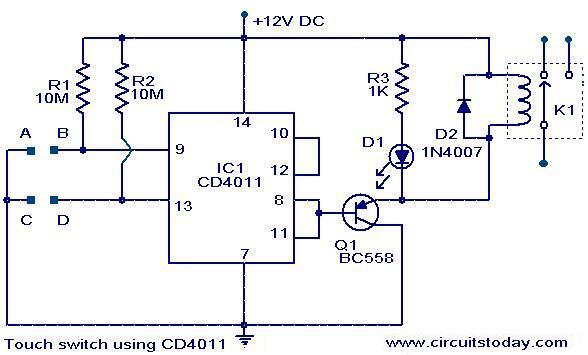 A simple touch switch circuit using CD4011 is given here. The IC CD4011 is wires as a flip flop here. The 9, 13 pins of the IC works as the set and reset contacts respectively.CMOS ICs like 4011 require requires a very low current for controlling its gates. Since the pins 9 and 13 are connected to the positive via resistors R1 and R2, the logic gates of the ICs will be in high state. When we touch through the points A, B the gates of the IC will be closed and the output becomes low. This switches ON the transistor Q1 and the relay gets activated. When we touch through the points C, D the gates again becomes high and switches the transistor OFF. This makes the relay OFF. Thus by touching through the contact points A,B and C,D the appliance connected through the relay can be switched On and OFF. The relay can be a 12 V, 200 Ohm SPDT relay. sir,can you please help me in making single button push to in/off switch which maintains its previous state after power failure. AS FOR THE DIODE: it is used to “kill” the negative voltage which is produced by the solenoid (the coild of the relay) if it is powered off. If not used, this voltage can destruct the transistor. – The transistor is connected wrong way and can be destroyed easily by exceeding its allowed voltage between base and emitter. Use an NPN tansistor (BC557 etc) and connect its emitter to the ground and its collector to the relay/diode. WHAT IS THE WORK OF D2 CONNECTED TO RELAY IN THE CIRCUIT? Can I use this as a main switch, is there any leakage current? Yes you can use but take care of relay contact ratings. Sir,I have a camera detached from a touch screen mobile as well as its big screen. So sir I need a circuit to see via the camera on the screen wireless.I request you to suggest me some sort of circuit suitable for this. Thank You. I NEED TO activat MANY RELAY(5 TO 10) USING MANY(5 TO 10) Touch switch. Hi pls send me any railway station used mini project circuits..
how can we specify the pcb board. my dear I have two resistance 300 ohm and four 100 ohm and I want circuit to conect to select. with selctor switch 20 step frst step 50 ohm secnt 100 ohm and 250 and 300 ohm and 350 going to last step 1000 ohm you can help me to make this circuit thank you.